The Dalbeattie Lawn Tennis Club was founded in 1980 and in a short time has grown to be one of the biggest clubs in the South West of Scotland. Facilities include 3 floodlit all weather courts and male and female changing rooms (with showers) with disabled access to club house and toilet. Contact the club coach Ian Macinlay on 01556 612954 for details of junior and senior sessions or email: eeemacker@hotmail.com. One-to-one sessions are also available for a reasonable fee. All group and private coaching information is posted on the court gates and in the clubhouse in Colliston Park, Dalbeattie. Club nights are held on a Friday from 7pm, all senior members are welcome to attend so long as they don't take it too seriously, it's a great fun night of tennis for only £1 (balls supplied). The format is mixed doubles, draw for partner on the night. The person with the most points at the end of the season wins a trophy, a number of runners up prizes are awarded at the end of season dance. The evening is usually brought to a close with drinks in the Kings Arms. 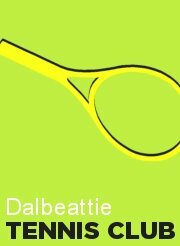 For further information on Dalbeattie Tennis Club visit them on Facebook.